Michael D.D. White, in the photo at right, captures an image from the vigil last night that drew about 150 people to gather outside the Barclays Center and then circle it twice in fairly quiet protest. Inside Jay-Z's 40/40 Club was opening for a private, pre-arena-opening party, as detailed in the New York Post video at bottom. White's photo captures the "Boondoggle Basics" flyer given out by protesting groups (more events today and tomorrow; rain venue 669 Atlantic Avenue, corner of S. Portland Avenue) framed by the digital advertising in the arena oculus for the 40/40 Club. The main sponsors are Brown Community Development Corporation, BrooklynSpeaks, Develop Don't Destroy Brooklyn (DDDB), the Fifth Avenue Committee, and Families United for Racial and Economic Equality (FUREE), which took different postures on Atlantic Yards before it passed, with only DDDB going to court to try to block the project. 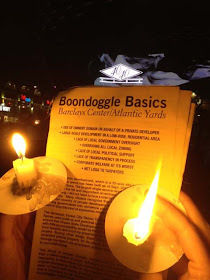 Since then, for example, DDDB and BrooklynSpeaks were joined in a successful lawsuit challenging the inadequacy of the environmental review, given that 2009 deal revisions gave developer Forest City Ratner 25 years to build the project. A Supplementary Environmental Impact Statement (SEIS) has been ordered but has not yet begun. Perhaps two dozen people came from Occupy Wall Street; some intended to sleep overnight, but the police seemed unwilling to allow that. Below, there are several more videos, most of them brief, that I shot. Click through for more coverage of last night's protest.